Mansoori owns a small eatery called the ‘Naaz Hotel’ outside the bus stand and it is here that he turns into a Good Samaritan every night. Every night at 8, a large group of beggars, destitute, homeless and the generally hopeless is seen outside the Nadra bus stand in Bhopal with hope shining bright in their otherwise dull eyes that they would sleep on a full stomach. The source of their only happiness of the day, every day, is Maqbool Ahmed Mansoori. 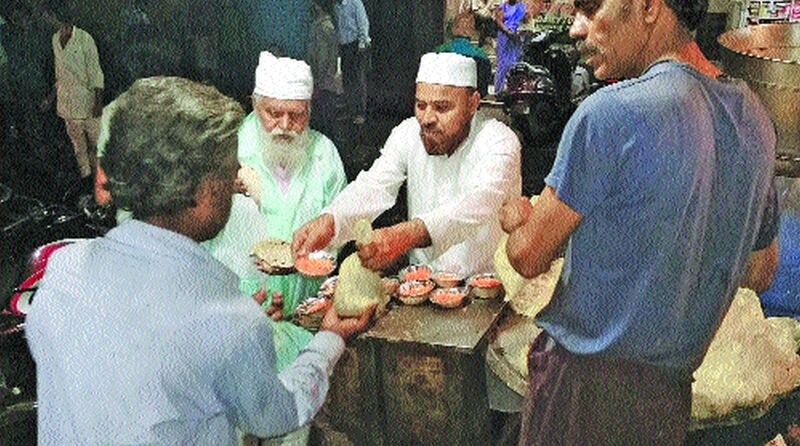 The 55-year-old Mansoori has been providing free food, of good quality, with his own hands to the needy every day for the five years or more at his ‘Langar-e-Aam’. “I am not a very rich person myself, but I am sure God has chosen me as his instrument to feed the needy every day, as all our religions teach us to do,” Mansoori says modestly. More than 200 hungry and helpless people get free food at the ‘Langar-e-Aam’ each night. “I started this service on ‘Labour Day’, 1 May 2013, and since then, by God’s grace, there has not been even a single day when food has not been served here,” Mansoori told The Statesman. The free food service is called a langar, because it serves as a community kitchen to feed everyone, irrespective of religion or caste. “We usually serve rice, vegetables and rotis and many times we are also able to add some sweet too,” said Mansoori. He says he started alone and faced several difficulties in the beginning to sustain the selfless service. “Initially all my earning from the hotel went into the langar, but with the support of God and my family, I kept on going,” he says with a smile on his face. After some time, some other good people also started coming to him from time to time and helped by providing rice, wheat or vegetables in bulk for the service. At present, Mansoori gets the assistance of Ramesh Singh, a septuagenarian Sikh, who brings rotis almost every night for the langar, making it a blissful example of communal harmony and brotherhood. Mansoori’s long-time aide, Sameer Bhai, is the man who cooks the food for the langar daily. “I have been working at Maqbool Bhai’s hotel since it opened in 1990 and for the past five years I cook fresh food daily for the langar,” Sameer said. Those who get food at the langar are all praise for Maqbool Mansoori. Even though they address him as ‘Bhai’, they regard him no less than a Messiah. “I am too old to work, homeless and penniless but each night I know I do not need to worry about my food,” says Ramesh, a beggar who is said to be about 70 years old but looks a lot older, as he holds his food with trembling hands. “I lost both legs after falling off a train some years ago. Since then I have been begging near the bus stand and the only bright thing during my entire day is coming to the langar,” said Ghanshyam, trying to hold his food packet while balancing himself on crutches. Mansoori points out he is not yet satisfied. “I aim to start the langar at five-six more points across the city, particularly near hospitals, so that I can serve more needy persons,” he says. “I am also planning to start a ‘roti bank’, from where the hungry and famished can get rotis 24 hours a day,” he says.